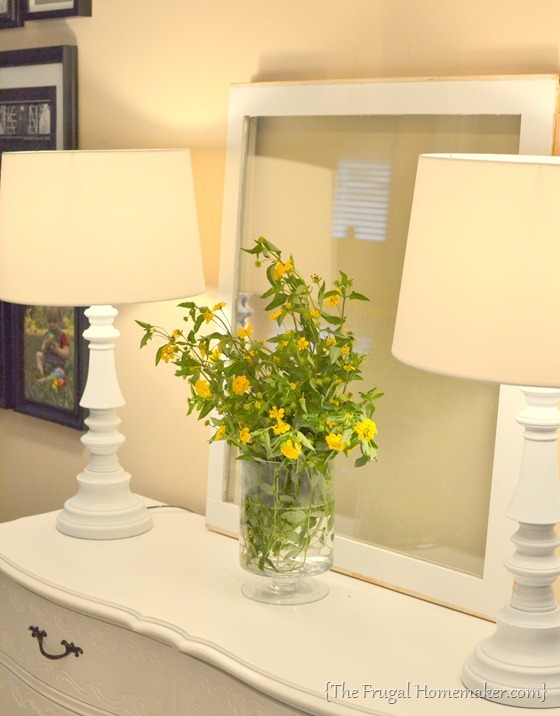 A total transformation with just a little bit of paint and $5 second hand lamps is a beautiful thing. Four years ago, when my blog was just a baby, I wrote my first post on my love of painting brass. It’s when everything was new and fun in the blog world, and my examples were so simple, yet we were brainstorming something that we just hadn’t thought much about yet. Now, the creative painting gurus come up with wonders and I love to see them all, but there’s still nothing quite like a quick and easy, Before and After. Whenever I am in a need of some therapy, I go on a spray painting rampage. Try it, it’s good for the creative soul, but somehow, I always tangent to this when I am about to have company over. Yes, I easily get side tracked from the things I am supposed to be doing. For example, my instantaneous Spring Trash to Treasure Tablescape. 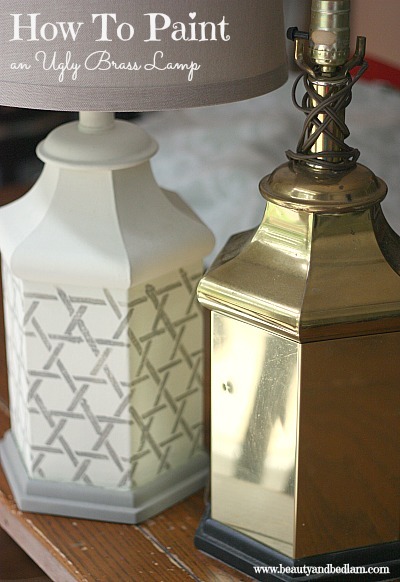 This lamp has gone through three transformations now and of course, it started as brass. Depending on what spray paint I have on hand, I typically start with one good coat of Primer and then follow with the color coat of my choice.Remember, short, quick sprays is best to avoid drips. If I have to buy new, Rustoleum and Krylon both have great 2 in 1 products which include both paint and primer. It’s a few dollars more more expensive, but worth every penny. 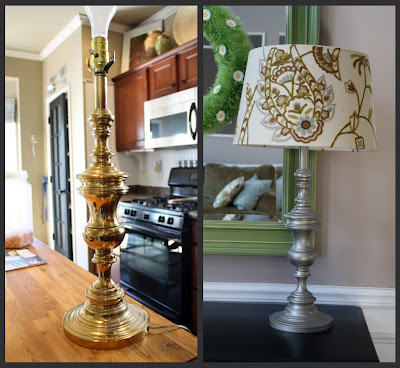 It’s definitely the kind of lamp you put in the Goodwill pile, until you see just how easy these ugly brass lamps are to restore. I buy them up left and right now for just a few dollars. These lamps were my sweet friend, Mary Jean’s thrifted $5 purchase for our Becoming Conference last year. She showed just how versatile Annie Sloan Chalk Paint is and how quickly it works. Now, they have found a home right in my great room. 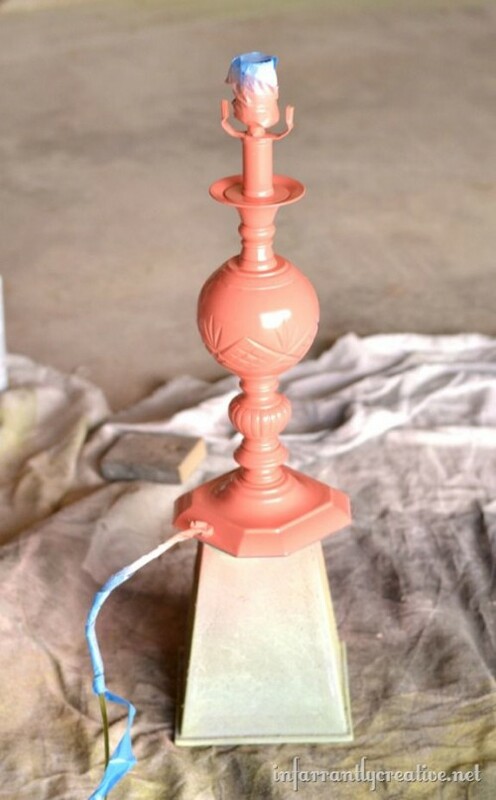 Since there’s no need for primer with Chalk Paint, just go to town with the color of your choice. In our case, the first coat is Old White, followed by the accent of Mocha. It’s such a beautiful contrast. Ironically, the top of my table is painted with Old White, so these two are fast friends. 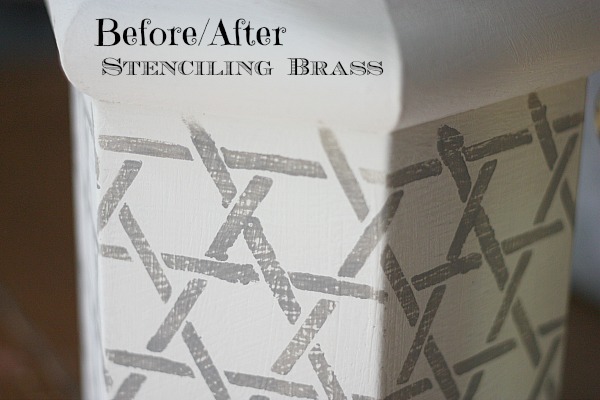 And the stenciling gives it such an elegant look. It’s truly eye catching when you walk into our great room. It’s just hard to believe that something so quick and easy can create such a beautiful difference, isn’t it? If I haven’t talked you into going on a brass painting rampage, here are a few more bits of inspiration that may do the trick. During our year of unemployment, there was zero money in the budget for…well, anything, and so I was forced to use what I had on hand in Painting my outdoor brass light fixtures. Four years later, and our fixtures still look great and have stood up to the elements beautifully! 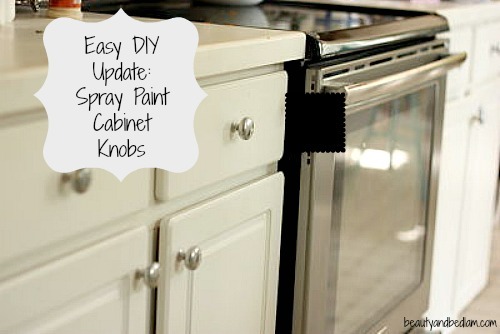 During that same time period, I went to town spray painting my brass kitchen knobs and it’s one of the quickest ways to update your kitchen for only a few dollars. Here are just a few more brass lamp redos from some friends. Again, start with spray paint and you’ll never look back on quick and easy projects. My sweet friend, Sarah from The Thrifty Decor Chick, shares my love of all things spray paint and her brushed nickel choice is perfect. 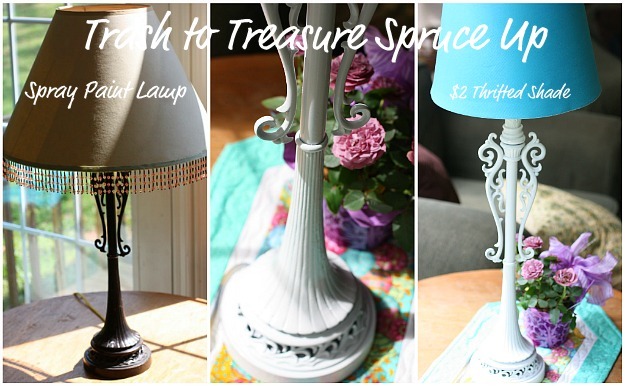 Christina did a beautiful job turning her $3.03 thrifted trash lamps into treasures. 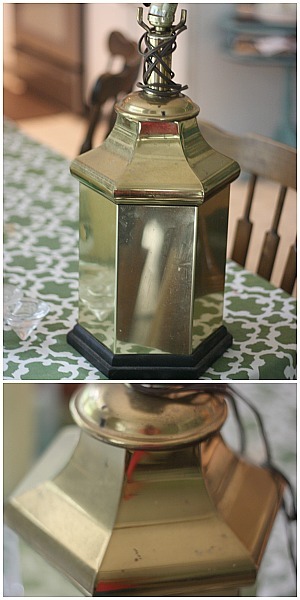 And I love that Becky from Infarrantly Creative found this brass lamp in the dumpster and repurposed it with a pop of great color for her night stand. With the weekend coming, I hope this has inspired you with a fun sense of painting purpose. Are you painting anything right now? I’d love to hear and I can’t wait to see what you do. I’ve been hunting the thrift stores for smaller clothes since I’ve got very little to wear right now while in the process of loosing weight, but I think I’d better start checking out the lamp area again for something with ‘good bones’ to beautify with paint! Thanks for the inspiration Jen! I am spray painting our plastic foam soap dispenser tops silver with a clear protective coat, for a bit of a more cutom and decorative look, since the nice ones online are $17+. I figure if the plastic ones are acceptable as-is in bathrooms, maybe slightly more decorative ones are even better. Love your site, but the advertisements are getting super annoying! Probably won’t be stopping by much anymore! I actually have an email into the server that puts up my ads with the same annoyance. Please stop by again. They should be stopping. I absolutely gave no approval for those pops ups, but I can’t get them to stop until they remove some coding. 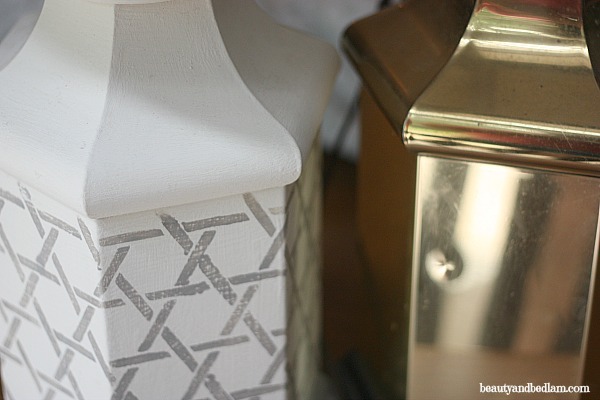 I just spray painted a lamp – shaped like a milk can – and it is beautiful. The part I have a problem with is getting a shade that I like for the style of the lamp. Do you have any hints to help? Thanks in advance. Actually brass is really in right now, I always do well when I sell it on etsy. I like your lamp also. I would have just removed the sheen. 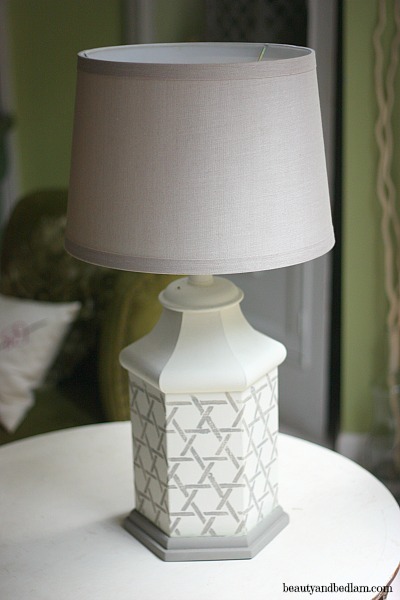 Love your painted & stenciled lamp! I have 2 brass lamps, expensive when I got them 25 years ago. I’m not into brass anymore, but my grown sons like them and want them as they are. So maybe I’ll find myself a lamp at Goodwill to paint. I need a lamp for the spare bedroom just vacated by my older son. My current painting project is a bakers rack that I picked up from my neighbors trash. It was discolored & peeling a bit, but I cleaned & sanded it and I’m painting it satin black. It will go on my back porch to hold plants. It was missing a shelf, which had been replaced with a piece of wood that was rotting. I purchased 2 large ceramic tiles & had them cut to fit and it will be perfect! New to your blog- love it! I’m so glad I found this post. I have an ugly 80’s swing lamp over my bed for reading that I was going to replace, but now I might just paint it and replace the shade. Yay! hi! my husband and I just purchased a foreclosure home for an awesome price…we redid the hardwoods and carpet and re-painted every square inch…the only problem is that the house was built in 1997 so a lot of the bathroom brass fixtures cant be replaced…so like shower doors have brass around them?? what is your suggestion to “fix” them? 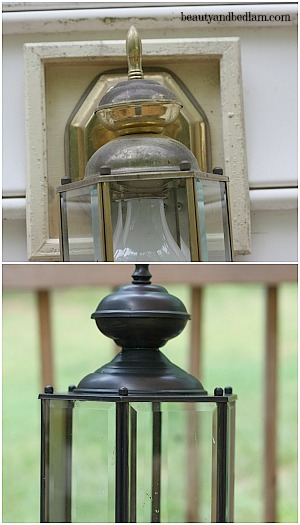 You just gave me a great idea to spray paint our two front porch wall lamps and our entry foyer lamp. All three are huge and very expensive to replace. I might turn them a steel gray or black. Thanks. YAY!! So glad. That will look fabulous!! I want to paint a brass bed. Is this possible? Yes, it definitely is. It would be the same process, but just make sure you use a good primer. Spray paint would be the easiest. How durable is this? After painting with chalk paint, what is the most durable sealer? Can I get a mat finish? Yes, chalk paint is more of a mat finish. I’ve had it painted now for 6 years and it still looks great.